Called to be missionary. Who me? In today’s world, there are so many references to mission. There are local missions to help those in need, missions to keep yourself healthy, mission statements, and on and on. It is no wonder that if you were to hear about the Pontifical Mission Societies in the Archdiocese of Philadelphia, you may just pass it by or think it is just another one of those groups. Or you may think, well it sounds like this group may doing something with Pope Francis in Rome — and you would be right! But would you know that this organization, the Pontifical Mission Societies, which has been in existence for 197 years, is responsible for helping bring to realization Jesus’ great command, “… Go, therefore, and make disciples of all nations” (Mt 28:19)? The Pontifical Mission Societies is an international organization that is present in over 120 countries. It exists to enable the Holy See by ensuring that those who are helped in their personal needs can, in turn, bear witness to the Gospel in the circumstances of their daily lives. 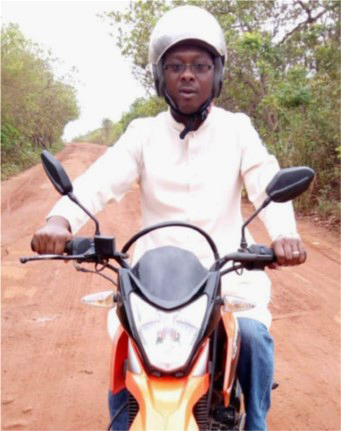 Father Obidi Gildas rides a motorbike to visit parishioners in Cote D’Ivoire, Africa. It exists to help a priest living in Cote D’Ivoire, Africa, to strengthen his flock by his presence. Father Obidi Gildas, pastor of St. Therese’s in the Diocese of Bondoukou, serves a large geographical area and tries regularly to visit 28 parish outstations to minister to his families. Travel is on motorbike over the dirt roads — if the weather and the roads are safe. When the rainy season comes, travel is impossible. The societies help Father Gildas purchase a pickup truck so he can continue his pastoral work, rain or shine, and proclaim God’s word. The Missionary Childhood Association, one of the Pontifical Mission Societies, helps children throughout the world. At the Mission Center of the Daughters of Charity Missionary Sisters in Bangkok, Thailand, children whose families cannot afford for their basic needs are fed and clothed, receive medical care and an education. Most importantly, the children find loving care and hope from hearing about Jesus. A Daughters of Charity sister visits with a family in Bangkok, Thailand. These words compelled him to go to the seminary and help point everyone to Christ. Many young men in mission lands, like Father Richard, hear the Lord’s call, but they lack the financial help to complete their studies. This much-needed support is received through the Society of St. Peter Apostle, another one of the Pontifical Mission Societies. The Pontifical Mission Societies is the organization in Philadelphia that is helping to do all of this! It continues to do the work that Jesus himself called each of us to do “… go and proclaim his name to the whole world.” Each of us are called to be missionary. Pope Francis, who has reminded all of us throughout his entire papacy, about our baptismal call to be missionary, has declared October 2019 as an “Extraordinary Missionary Month.” In response to this request by the Holy Father, Archbishop Charles Chaput has approved an Extraordinary Year of Mission in the archdiocese. Look for more about this extraordinary year coming soon. Msgr. 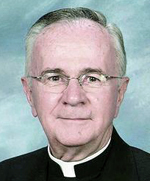 Arthur E. Rodgers is archdiocesan director of the Pontifical Mission Societies. The Pontifical Mission Societies were born as a means of supporting the preaching of the Gospel to every nation. The prayers, humanitarian relief and material support generously given and distributed through the Pontifical Mission Societies aid the Holy See in 1,111 mission dioceses to help build up the local church, especially where Christianity is new. The societies care for and support these churches until they are able to be self-sufficient. There are three Mission Societies: The Society for the Propagation of the Faith supports the evangelization efforts of the local church. The Missionary Childhood Association educates children about their part in the church’s missionary work, asking for their prayers and sacrifices. And the Society of St. Peter Apostle trains our next generation of missionary priests and religious men and women. Learn more about this organization at the website phillymissions.org/. PREVIOUS: In yet another clerical abuse scandal, what’s a Catholic to do?